Outside Wrigley Field, members of The Illinois Coalition for a Moratorium on Fracking protest a regulatory bill that recently passed the state legislature. 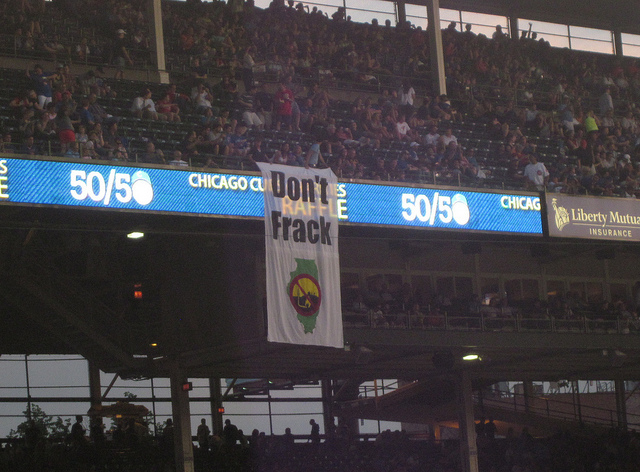 Amid a warbling Lowery organ rendition of “Build Me Up Buttercup” blasting from pre-game Wrigley Field, environmental groups gathered outside Wrigley View Rooftop to make their voices heard on pending fracking regulations. The targets of their signs and chants were state governors in town for the Democratic Governors Association, meeting this week in Chicago. In addition to Gov. Pat Quinn, whose signature is expected soon on a regulatory bill passed recently by the state legislature, protestors watched for Maryland Gov. Martin O’Malley and California Gov. Jerry Brown — two leaders similarly mulling over whether to permit the controversial process for natural gas and oil extraction in their states. While Quinn greeted news of the bill’s passage by promising his signature, protestors pointed out the governor could veto certain provisions in the massive regulatory bill, sending it back to the General Assembly, even if he does not block its passage into law. 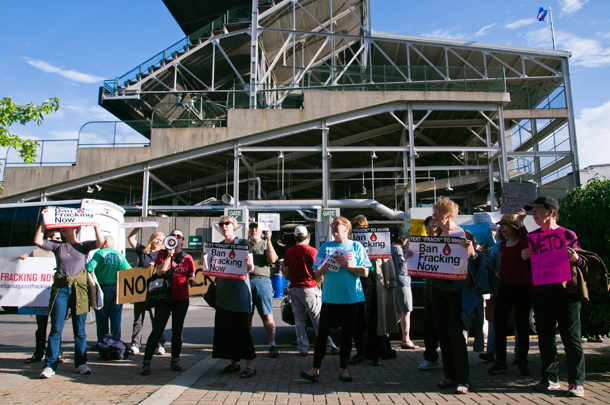 Some environmental groups are still holding out hope for an outright ban on fracking in Illinois. Politicians previously floated bills calling for a two-year moratorium on fracking in both the house and senate. The groups, who are organized under The Illinois Coalition for a Moratorium on Fracking, cite relatively lax standards regarding setbacks, or how far from certain areas drillers are allowed to dig wells. Setbacks from rivers and lakes are only 300 feet in the regulatory bill, while environmental groups have called for a buffer zone 11 times wider. 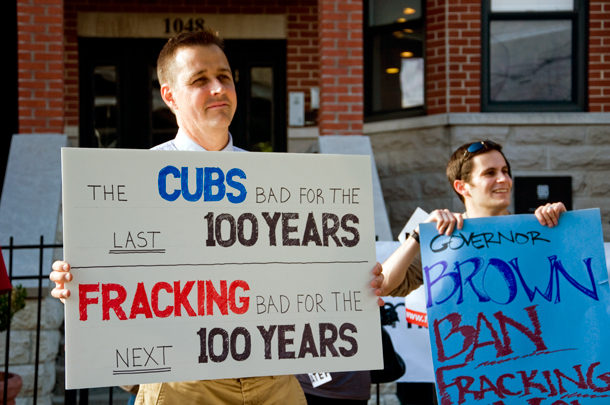 They also challenge statements that fracking will bring significant revenue and jobs to Illinois, pointing out that tax rates are low compared to other states and a relatively small portion of taxes collected go to drilling counties. “There are serious holes in this bill,” said Lora Chamberlain, a member of the moratorium coalition. In the bill’s year-long march towards becoming law, major environmental groups including the Sierra Club and Natural Resources Defense Council were given unusual access to a process typically maligned for ignoring such advocacy and consumer groups. Supporters of the bill say scrupulous collaboration with green groups resulted in the nation’s toughest regulatory bill. Many of those groups support a moratorium publicly, but offered their guidance during the drafting of the bill rather than be shut out. With Quinn on record “look[ing] forward to signing the legislation,” the groups looking for revisions or an outright ban have an uphill fight. Still, Chamberlain said, it’s worth trying. “We’re doing everything we can,” she said.